Tom Tom comes up trumps again with this easy to use, basic in-car map guide that takes you where you want to go, most every time. I’m not a habitual user of in-car navigation units, preferring my old map book to get me around. In fact, I’m still using the map book I bought in 2000 when I first came to NZ; it’s supplemented by a quick look at the Wises website before a meeting, so I know where to go before I leave home base. Having said that, I totally see the need for these things. Just what you need in a strange city, when you’re in a hurry or when you just want to get somewhere without having to think about where you’re going. Presuming that any GPS system will actually get you to your destination without dumping you in some back woods off-road no-horse town when you really just wanted to go to Hamilton (oops, bad example). If I had to buy a GPS unit, I’d forego the bells and whistles. Give me a simple device and keep the cameras, Bluetooth or any other fancy things I’ll never use, which is where Tom Tom’s XL 250 comes in. 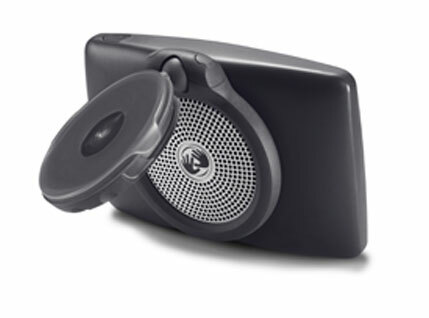 The XL 250 is a plain enough unit with just about everything anyone could actually need in a navigation device. It’s compact enough to cart along when it isn’t in the car, while the mount and locking system are stable, secure and easy to install or remove. Useful features geared towards actual navigation abound, including Advanced Lane Guidance; Spoken Street Names; Safety Cameras; Map Share and IQ Routes. They all work as described, with the Advanced Lane Guidance and IQ Routes being the most obvious and most handy. Advanced Lane Guidance changes the view on screen to show the lane to take at freeway off ramps and also shows which lane you need to be in the rest of the time, which is an excellent aid. IQ Routes does a decent job of picking the best route for a specific time of day based on uploaded data from other Tom Tom owners; it will often send you in seemingly strange directions, but gets you there in the end with less of a snarl up than expected. Less than useful were the supplied celebrity voices. Call me a curmudgeon but hearing Yoda, Billy Connolly or Snoop Dogg tell me the same thing over and over gets old in a hurry. Still, you can use them if you like (or if it will amuse the kids) or you can just pick one of the standard voices. English speakers get shortchanged here because the foreign ladies sound so much more interesting (Italy and Russia would be my choice if only I spoke the lingo). Something else to consider is that this unit only comes supplied with NZ maps; if you want Australia as well, you have to pony up some coin. 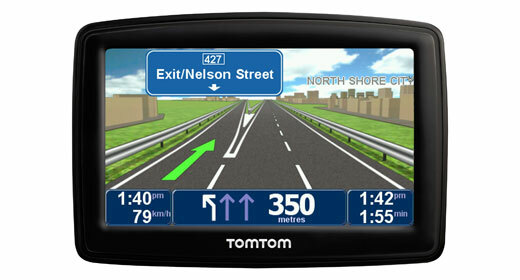 Try as I might, I couldn’t find the XL 250 on the Maps section of the Tom Tom site, but the Aussie maps for the XL 340 and XXL 550 were both priced at $99.95 Australian. A “Latest Map Guarantee” comes with the unit – if the map is updated within 30 days of the purchase date of the unit, you can download it for free. I had zero navigational issues during my time with the XL 250, and it generally knew where it was going better than I did. The only operational issues I could find were that there’s no AC adaptor, so you need to use USB or the car lighter adapter, and that the maximum volume was a wee bit too low when I had music playing on the motorway (perhaps people with quieter cars may not even notice). There’s still no dedicated and foolproof anti-theft system in this unit, or in any of the current devices for that matter. Time for a standard perhaps? Codes? Better mounts? 20,000 volts? Owning a GPS shouldn’t say “break into my car” like it currently does. The one thing this review does not tell me is whether or not the Tom Tom system is Mac compatible! If it isn’t, I’m not interested! But it would be nice to know whether I should be considering any Tom Tom, or rather go to another make. Your article is very helpful and everything is being explained very well. Keep it up!